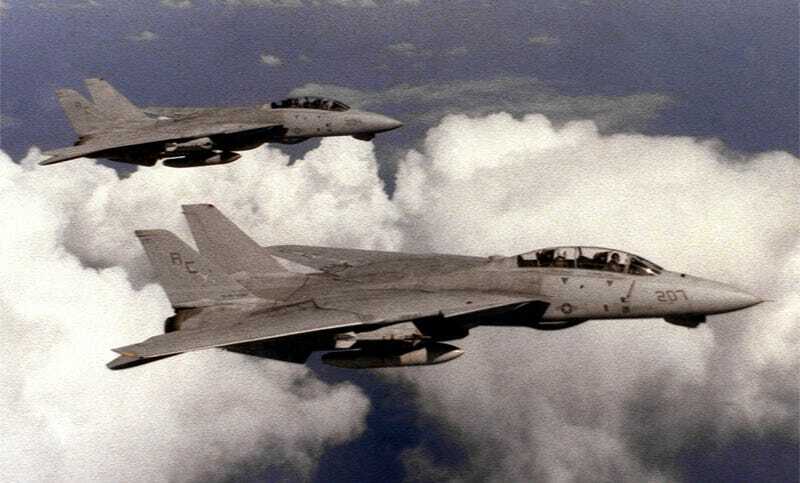 Although it’s more audio than video, it’s fascinating to hear the tension as a pair F-14 Tomcats intercept and engage a pair of Libyan MiG-23 Floggers over the Gulf of Sidra. Small segments have been released before of the historical 1989 shoot-down, but this release includes the entire intercept leading up to the dogfight. As you watch, here is a glossary of terms used in the video so that you have a better idea of what is actually going on with all the radio calls. Angeles- Blocks of thousands of feet. Example, “angels 21” is 21,000 feet. Bogey- Unidentified aircraft, usualy a radar contact. Once the aircraft is indentified and deemed a threat it becomes a Bandit. Offset- Approaching a target not head on but offset to one side by a number of degrees. Warning yellow, weapons hold- There is a threat to the battlegroup, still peacetime rules of engagement apply. Master Arm- Basically a combat aircraft’s safety. Once activated, the aircraft’s weapons become ready to be fire or released if toggled. Fox 1- Fox is firing air-to-air missile. Fox 1 for a semi-active radar-homing missile, namely the AIM-7 Sparrow. Fox 2 is for an infrared guided missile, namely the AIM-9 Sidewinder. Fox 3 is for an active radar guided missile, namely the AIM-54 Phoenix or now the AIM-120 AMRAAM. Tone- When the sidewinder’s seeker locks onto a target an audible signal in the pilots headset goes from a low growl to a higher pitched steady tone, at which time the pilot can fire the missile knowing it is locked onto a target. Tally- Call to convey visual identification of an object, often followed by a number of how many can be seen. Today the two VF-32 Tomcats involved in the 1989 shoot-down have been spared the scrappers torch, with one, which was upgraded to a D model, being displayed at the Smithsonian Air And Space Museum’s Udvar Hazy Center and the other awaiting a museum placement at the Defense Department’s massive boneyard (AMARG) adjacent to Davis Monthan AFB in Tucson, Arizona.